FunBox Blog: Ok so Have You Heard of the Domestic Silver Fox? So there was this scientist in Russia, Dimitri Belyaev. He was trying to find a way to breed tamer foxes. The reason was so that it would be easyer to raise them on farms for fur coats (keep in mind this was 50 years ago so there weren’t huge protests). So all he did was breed for tameness. When he went into their cages he measured how far away they ran and if they tried to bite. The ones that didn’t run away or were less aggressive were selectively bred. In just 18 generations he had produced those adorable foxes you see in the picture above. Aren’t they cute? He didn’t breed for those coats or floppy ears that just happened as a side effect of tameness! They also stopped smelling bad, wagged their tails and barked. 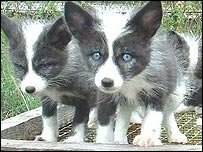 They were little dog-like foxes. You can buy them as pets FYI. I’ll start the bidding at adorable.